There are hundreds of billions of stars in our own Milky Way galaxy. Estimates indicate a similar number of galaxies in the observable universe, each with its own large assemblage of stars, many with their own planetary systems. Beyond and between these stars and galaxies are all manner of matter in various phases, such as gas and dust. Another form of matter, dark matter, exists in a very different and mysterious form, announcing its presence indirectly only through its gravitational effects. 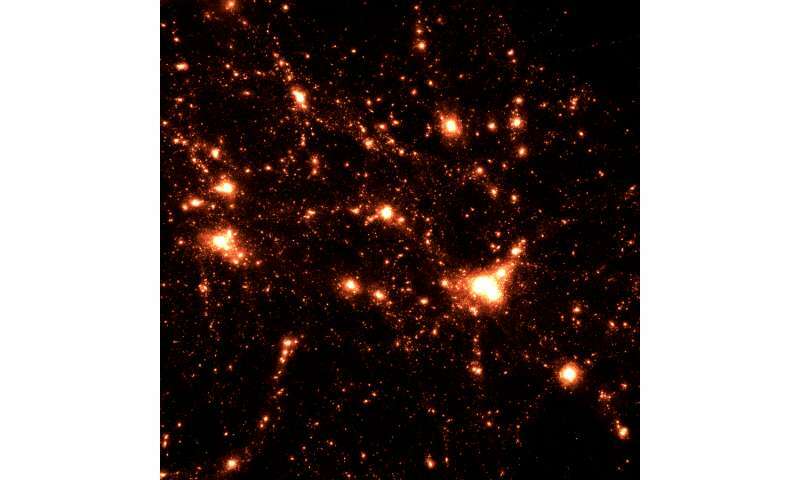 "We're simulating all the processes in the structure and formation of the universe. It's like solving a very large physics puzzle," said Habib, a senior physicist and computational scientist with the High Energy Physics and Mathematics and Computer Science divisions of the U.S. Department of Energy's (DOE) Argonne National Laboratory. Habib leads the "Computing the Sky at Extreme Scales" project or "ExaSky," one of the first projects funded by the recently established Exascale Computing Project (ECP), a collaborative effort between DOE's Office of Science and its National Nuclear Security Administration. From determining the initial cause of primordial fluctuations to measuring the sum of all neutrino masses, this project's science objectives represent a laundry list of the biggest questions, mysteries and challenges currently confounding cosmologists. Initiated to drive the development of an "exascale ecosystem" of cutting-edge, high-performance architectures, codes and frameworks, the ECP will allow researchers to tackle data and computationally intensive challenges such as the ExaSky simulations of the known universe. "Salman's research certainly looks at important and fundamental scientific questions, but it has societal benefits, too," said Paul Messina, Argonne Distinguished Fellow. "Human beings tend to wonder where they came from, and that curiosity is very deep." For Habib, the ECP presents a two-fold challenge—how do you conduct cutting-edge science on cutting-edge machines? The cross-divisional Argonne team has been working on the science through a multi-year effort at the Argonne Leadership Computing Facility (ALCF), a DOE Office of Science User Facility. The team is running cosmological simulations for large-scale sky surveys on the facility's 10-petaflop high-performance computer, Mira. The simulations are designed to work with observational data collected from specialized survey telescopes, like the forthcoming Dark Energy Spectroscopic Instrument (DESI) and the Large Synoptic Survey Telescope (LSST). Survey telescopes look at much larger areas of the sky—up to half the sky, at any point—than does the Hubble Space Telescope, for instance, which focuses more on individual objects. One night concentrating on one patch, the next night another, survey instruments systematically examine the sky to develop a cartographic record of the cosmos, as Habib describes it. Unique among codes used in other exascale computing projects, it can run on all current and prototype architectures, from the basic X86 chip used in most home PCs, to graphics processing units, to the newest Knights Landing chip found in Theta, the ALCF's latest supercomputing system. "When you run very large simulations of the universe, you can't possibly do everything, because it's just too detailed," Habib explained. "For example, if we're running a simulation where we literally have tens to hundreds of billions of galaxies, we cannot follow each galaxy in full detail. So we come up with approximate approaches, referred to as subgrid models." Even with these improvements and its successes, the HACC code still will need to increase its performance and memory to be able to work in an exascale framework. In addition to HACC, the ExaSky project employs the adaptive mesh refinement code Nyx, developed at Lawrence Berkeley. HACC and Nyx complement each other with different areas of specialization. The synergy between the two is an important element of the ExaSky team's approach. "Before you spend the money to build a telescope, it's important to also produce extremely good simulated data so that people can optimize observational campaigns to meet their data challenges," said Habib. But the cost of realism is expensive. Simulations can range in the trillion-particle realm and produce several petabytes—quadrillions of bytes—of data in a single run. As exascale becomes prevalent, these simulations will produce 10 to 100 times as much data. "All of these things can help the ECP community optimize their systems," noted Habib. "That's the fundamental reason why the ECP science teams were chosen. We will take the lessons we learn in dealing with this architecture back to the rest of the science community and say, 'We have found a solution.'"